Experts from Washington and Seoul seem to agree that the weapons test observed by North Korean leader Kim Jong Un earlier this week wasn’t a ballistic missile and doesn’t change the strategic situation on the Korean Peninsula. “We see it as a guided weapon for the purpose of ground battles,” an officer from South Korea’s Joint Chiefs of Staff told Yonhap News Agency Friday, adding it does not appear to be a ballistic missile. The state silences those that disagree with the “official narrative” because this allows them to control the population. Mike Adams hosts to discuss why being curious is so important to liberty in society. The US agreed, with acting Defense Secretary Patrick Shanahan saying the weapon was “not a ballistic missile” because no observation or early warning system had detected that kind of launch. Eric Brewer, a former director for counterproliferation at the National Security Council, told CNN the test was “not that concerning,” but was probably meant to pressure Washington into returning to the negotiating table. Citing analysts, Yonhap said the weapon is probably similar to the Israeli-made Spike anti-tank guided missile (AGTM), a highly sophisticated weapon that can be fired from a vehicle mount or from a soldier’s shoulder and has a range of about 4 kilometers. If it is an AGTM on the scale of the Spike, it likely represents a significant leap forward for North Korean ground forces in terms of anti-tank weaponry. Like much of its weaponry and vehicles, the Korean People’s Army mostly makes use of old Soviet anti-tank weapons like the 9M113 Konkurs and the newer, Russian-made 9M133 Kornet. It remains unclear if this weapon is the same one KCNA reported Kim inspected last November, which the state-owned news agency noted had been “researched and developed for a long time,” since Kim’s father and predecessor, Kim Jong Il, ran the country between 1994 and 2013. DPRK hasn’t tested a ballistic missile of any type, whether for weapons delivery or satellite launch, since November 28, 2017. As a gesture of goodwill, Kim placed a moratorium on all ballistic and nuclear tests in a bid to bring Washington to the negotiating table that was ultimately successful last June. Regulations being enacted by the EU/UN actually benefit Big Tech and the globalist agenda of censorship. Alex breaks down solutions for President Trump to act on to keep America from this digital tyranny. The arrival of Russian military planes in Venezuela in March 2019 spurred harsh criticism from the US, who has accused Moscow of destabilizing the situation in the Latin American state currently engulfed in a political crisis. Russia, for its part, has recalled that its planes arrived under a bilateral agreement with Caracas. The US has called on the international community to deny Russian planes flying to Venezuela a right of passage through their airspace, following the example of such a move by Malta. Ortagus said that such a decision could help stop Russian support for the country’s President Nicolas Maduro. Russian Foreign Ministry spokeswoman Maria Zakharova earlier stated that Malta had refused to provide a green light for the passage of two Russian planes carrying cargo and personnel to Venezuela. The spokeswoman noted that Malta didn’t provide any reason for denying it and added that Moscow will take this fact into consideration in its bilateral relations with the island nation. Which swamp creatures will flip on the deep state now that their plan to take down President Trump is being revealed to the American people? Venezuela has been engulfed in a political crisis, which took another turn after opposition figure, Juan Guaido proclaimed himself the country’s interim president. The move was immediately supported by the US and most western states, but was harshly criticized by Russia, Turkey, China, and many other countries. They expressed their support for the constitutionally elected president, Nicolas Maduro. Washington has lambasted Moscow’s support for the president and specifically the arrival of Russian planes carrying military personnel in March 2019. The US called their arrival an “unwelcomed provocation”. At the same time, Moscow said that its military personnel had arrived to carry out maintenance on Russian military tech under a bilateral agreement with Caracas. Whenever an outsider becomes influential in society, the establishment is eager to attack them in order to keep control. Dr. Nick Begich breaks down exactly what is going on with the fake news smears against President Trump, Infowars, and other patriots world wide. Turkey has confirmed it arrested two UAE intelligence operatives in Istanbul on Monday, which senior officials say could be linked to last year’s murder of journalist Jamal Khashoggi. According to Reuters, citing an unnamed official who made the arrest public on Friday, they “confessed to spying on Arab nationals on behalf of the United Arab Emirates,” after they were apprehended as part of a Turkish counter-intelligence investigation. The probe into the spies’ activities immediately spotlighted the Oct. 2 Khashoggi murder, given the well-known close ties between Saudi and UAE intelligence and military operations, and given the time of the operatives arriving in Turkey. In January of this year it was revealed that the UAE has been engaged in aggressive and invasive spying operations against its own citizens called ‘Project Raven’. A prior Reuters investigation found it was even recruiting American former spies and NSA specialists in order to monitor Arab dissidents. Alex Jones talks over the phone with callers and gauges their reactions to AG Barr discussing the redacted first part of Mueller’s report. As many as 1,500 Islamist terrorists with combat experience are now in Europe, according to the head of Russia’s Federal Security Service (FSB). 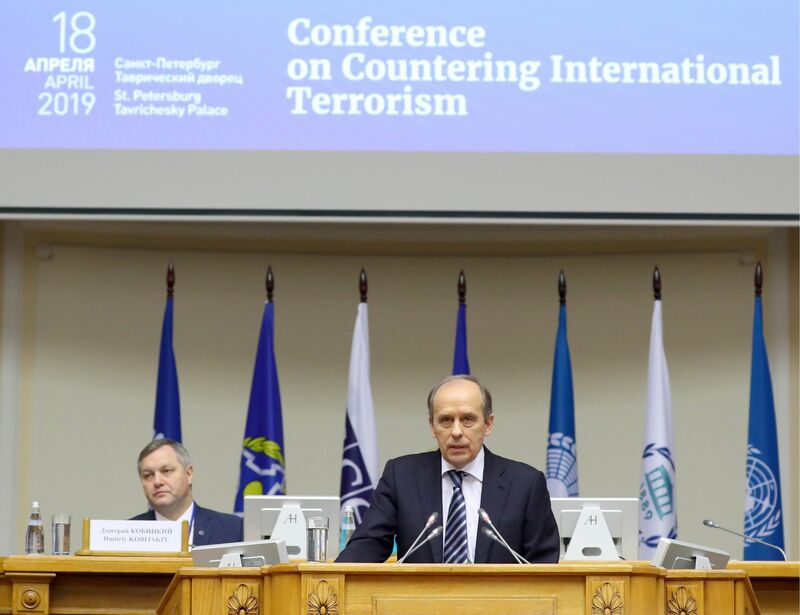 The fighters were sent by their chieftains to commit terror attacks, FSB Director Alexander Bortnikov stated during a conference on international terrorism Thursday. Despite ISIS’ and Al-Qaeda’s recent losses in Syria and Iraq, they still pose a serious threat due to autonomous networks scattered around the world, he added. Similarly, in March, a Swedish politician cited a defense report warning how Salafist hardliners are utilizing modern tech to spread their messages across Europe. “We see that some Salafist groups use social media, lectures with ministers, and collaborations with organizations abroad to spread their messages,” said the report’s author. The attention span of the population has been shrinking for decades as the globalists seek even more control over the population. Dr. Nick Begich joins Alex in studio to expose the attack on our minds by Big Tech. Earlier in the day, it was reported by The Libya Observer that Field Marshal Khalifa Haftar’s army had regained control over the Tamanhint Base following the withdrawal of the South Protection Force loyal to the Government of National Accord (GNA). The Interior Ministry of Libya’s internationally-recognized Government of National Accord (GNA) on Thursday accused France of supporting the head of the Libyan National Army (LNA), Marshal Khalifa Haftar, and said it would halt security cooperation with the French authorities. “The cooperation with the French side on bilateral agreements in the area of security is halted,” the ministry said in its Facebook blog. According to the ministry, the decision extends to agreements with France on joint military exercises. At the same time, the Government of National Accord has issued an arrest warrant for Haftar for allegedly ordering airstrikes against civilian areas. Besides the marshal himself, six Haftar’s officers have also been named in the arrest warrant. Alessandra Bocchi joins Owen Shroyer on The War Room to break down Hillary’s legacy in destabilizing Lybia. The new wave of clashes in Libya commenced on 4 April, when Haftar ordered his troops to advance on the Libyan capital to free it from what he called terrorists. As a result, the LNA gained control over the cities of Surman and Garyan located near Tripoli. After the move, the GNA announced a counteroffensive on 7 April, dubbed Volcano of Rage, to confront the LNA. On Friday, Japanese Defence Minister Takeshi Iwaya announced that the country’s authorities had launched an underwater search and recovery operation to retrieve the wreckage of a Japanese F-35 fighter jet that mysteriously disappeared from the radars during drills over the Pacific Ocean on 9 April. Washington and Tokyo are yet to recover the missing Japan Air Self-Defence Force (JASDF) F-35A fighter jet as they have been conducting “a tireless, around-the-clock search” for the fifth-generation stealth plane since 9 April, Business Insider (BI) reports. “With the help of the United States, we will continue to take the leading role in investigating the cause of the accident,” Iwaya added. Earlier, he announced that Tokyo would ground the JASDF’s whole fleet of F-35A stealth fighters in the wake of the incident. President Trump has made it clear he wants to bring the troops home, but the military industrial complex remains in control of America’s military policies. The Japan Times also quoted an unnamed Japanese Defence Ministry spokesman as saying that the remains of the F-35 jet’s tail had been found but they were yet to track down the rest of the fuselage, as well as the pilot. “On average two aircraft, including a helicopter, and two patrol vessels are constantly deployed in the around-the-clock search operations,” the official said. The statement came after an unnamed Pentagon spokesman told BI that the US “stands ready to support the partner nation in recovery” of the missing warplane. He also emphasized “how serious the US is about ensuring that [the F-35A’s] advanced technology doesn’t fall into the wrong hands”, BI reported. The JASDF’s F-35A Lightning II Joint Strike Fighter, while being flown by 41-year-old Major Akinori Hosomi, reportedly disappeared from radars on 9 April, 135 kilometers (84 miles) east of the Misawa Air Base located in the country’s northern Aomori prefecture. The incident took place during a training flight involving four F-35A fighters; it is the first case of an F-35A crashing, as the warplane, introduced in 2016, has only recently come into service in various countries. Instagram has begun blocking pages belonging to Iran’s Islamic Revolution Guard Corps (IRGC) following the organization’s official listing as a “Foreign Terrorist Organization”, or FTO on Monday. The commander of the IRGC’s elite Quds force, Qassem Soleimani, finally had his page blocked following this week’s designation. He had maintained the account for two-and-a-half years, for which he frequently posted anti-American political messages and threats. And the IRGC’s official page was also blocked, which had nearly 1 million subscribers. Interestingly Instagram had never previously moved to permanently shut down Soleimani’s account despite him being individually designated a foreign terrorists by the US Treasury all the way back in 2011, though it had been temporarily blocked several times in the past for violating the platform’s rules. Among a number of prior threatening images, Gen. Soleimani had last year posted an artistic rendering of himself standing in front the White House, depicted as on fire after an explosion. Neither the post nor himself were blocked following a number of media outlets highlighting the threatening image at the time. Soleimani had over 100,000 Instagram followers, compared to President Hassan Rouhani’s 2.2 million, though the latter’s is still active. Other accounts blocked belonged to several IRGC high-ranking officiers, such as Gen. Mohammad Hossein Baqeri Gen. Mohammad ALi Jafari, top commander and Gen. Haj Saeed Qassemi. Thus many analysts saw this week’s action by Instagram as long overdue. However, others argue that blocking the IRGC’s media pages is tantamount to censoring important communications from the military of a sovereign nation. Alex Jones conducts an exclusive interview with Avi Yemini. A court in Bahrain sentenced 138 people to jail and stripped them of their citizenship for conspiring to create a “terror” cell linked to Iran’s elite Revolutionary Guards force, the country’s public prosecutor said. The mass sentencing was “the largest” revocation of nationality since the country started using the punishment in 2012, the Europe-based Bahrain Institute for Rights and Democracy (BIRD) said. The 138 people received sentences ranging from three years to life imprisonment. One man was jailed, but did not have his citizenship revoked. The group was accused of forming a “Bahraini Hezbollah” — a reference to the Shiite militant faction in Lebanon — with Iranian help, to carry out terrorist attacks in Sunni-ruled Bahrain. Some of them were alleged to have received military training in Lebanon, Iran and Iraq. Nearly 100 defendants were fined some $265,000 (€235,000) each. The exchange of missiles between the IDF and Iranian forces based in Syria represented a major escalation of a conflict that has been simmering at a low level for months. Post-2011 Repression: Bahrain’s Sunni-dominated government has banned opposition groups and tried to silence other opponents since a 2011 crackdown on large protests by the country’s Shiite population. The ruling monarchy accuses Shiite-majority Iran of training militias to instigate a coup. Increasingly Popular Sentence: The verdict brings the total number of people who have had their citizenship revoked since 2012 to 990, BIRD said. In May, 2018, a court denaturalized 115 people in a single trial. Close US, Saudi Ally: Bahrain hosts the US Navy’s 5th Fleet and has close ties to neighboring Sunni-ruled Saudi Arabia. The Saudi government has led attempts by Sunni-ruled countries to oppose any growth in Iranian influence in the region. Although many people were recorded celebrating the Notre Dame fire online, the MSM is pushing the false narrative that conservatives are creating fake news. Russian S-400 air defense systems will not be integrated into any active NATO military systems, Turkish Defense Minister Hulusi Akar said in Washington on Monday. “This system will not be integrated neither with NATO’s systems nor with any other somehow connected to NATO’s national [military] systems,” the minister said during an annual US-Turkey conference in Washington. He vowed that the decision would not change any of Turkey’s commitments to the North Atlantic Treaty Organization (NATO). The Turkish minister also expressed hope that other NATO countries would also keep their commitments to Turkey. The authoritarian establishment media is now openly reporting anyone who disagrees with them to front organizations of the military industrial complex, NATO & the Democrat Party. Commenting on the technical discussions with the United States, the minister noted that Turkey was ready for them and it would address concerns over Ankara’s procurement of Russian S-400 air defense systems. The remarks come after earlier this month, the Pentagon announced that Washington halted deliveries and activities with Turkey on its F-35 fighter jet programme over Ankara’s decision to purchase S-400 air defense systems. In December 2017, Russia and Turkey signed a loan agreement for the delivery of S-400 air defense systems to Ankara. The Russian-Turkish cooperation on S-400 deliveries has been criticized by NATO and the United States, which have cited security concerns and the inability of integration between S-400 and NATO’s air defense systems. Ankara, for its part, has said that the purchasing of military equipment is its sovereign affair and ruled out the possibility of abandoning the deal with Moscow. The first S-400 shipment is expected to be delivered to Ankara in July.